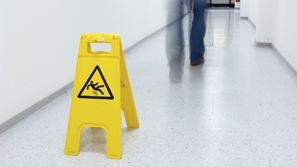 Slip-and-fall accidents are probably the most common, and most well-known, type of premises-liability case. If you or a loved one has been injured in such an accident, you know it is no laughing matter. Injuries from slip-and-falls can be serious and life-threatening, ranging from simple sprains or bruises to compound fractures, brain injuries or paralysis. The most common causes of slip-and-fall accidents include wet floors, uneven or damaged stairs, faulty railings, obstructed walkways, and icy sidewalks. But just because you slip and fall on someone else’s property doesn’t mean you have an open-and-shut case. Though the law requires that property owners and operators take reasonable steps to keep their stores safe for customers and visitors, a plaintiff must be able to prove that a property owner either caused the dangerous condition, or knew or should have known that it existed. Sorting through the specific circumstances and laws governing such cases, the attorneys at The Law Offices of Frank L. Branson represent victims and their families in order to help them obtain compensation for medical costs, lost wages, pain and suffering, and other damages in meritorious cases. To learn more about our experience in slip and fall matters, we invite you to contact the firm here.